Check out the analysis logbook. Or how about the RUNLIST. 1) "Inclusive Scattering from Nuclei at x>1 and High Q2 with a 5.75 GeV Beam,"
2) "Inclusive Scattering from Nuclei at x>1 and High Q2 with a 5.75 GeV Beam,"
3) "Inclusive Electron Scattering from Nuclei at x>1 and High Q2 with a 5.75 GeV Beam,"
4) "A Precise Measurement of the EMC Effect in Light Nuclei,"
5) "Precise Measurement of the Nuclear Dependence of Structure Functions in Light Nuclei,"
6) "Inclusive Electron Scattering from Nuclei at x>1 and High Q2 with a 5.75 GeV Beam,"
7) "New Measurement of the EMC Effect in 3He and 4He,"
8) "Precise Measurement of the EMC Effect in Few Body Nuclei and at Large x,"
9) "Inclusive Electron Scattering from Nuclei at x>1 and High Q2 with a 5.75 GeV Beam,"
10) "New Measurements of the EMC Effect in Few-Body Nuclei,"
11) "Inclusive Electron Scattering from Nuclei at x>1 and High Q2 with a 5.75 GeV Beam,"
6) "New Measuements of the EMC Effect in Very Light Nuclei", J. Seely, A. Daniel, et al (nucl-ex/0904.4448). Submitted to PRL. 2) Eric Christy's talk about analyzing inclusive data in Hall C.
3) John's "long paper/report" containing info that may be helpful for analyzers. 1) Pictures of the target ladder (Sep. 1 2004) can be found here. 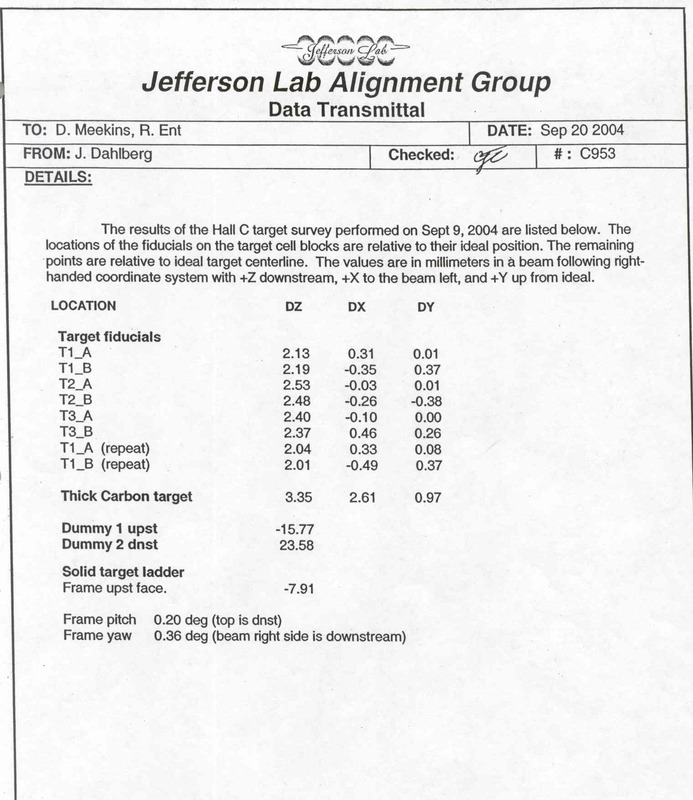 2) Meek's report on the target configuration is here. 4) The thermometry was a little off for the June-July period. Here you can find my estimate of the effect on the cryotargets. 6) The He-4 target had a leak this fall. 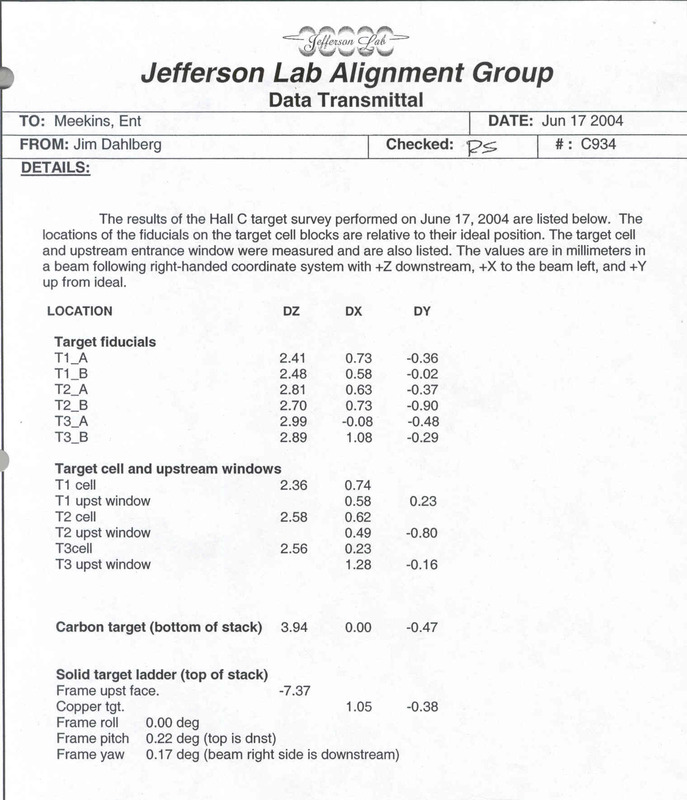 Aji has calculated the change in the target density. See his log entry here. 7) The He-3 target also apparently had a slow leak. Here is Aji's log entry and his run-by-run target density file: he3density.dat. UPDATE: A small mistake was found - Aji has updated densities here. Note that in the above discussion, I used the carbon target. The cryotargets are slightly offset relative to carbon. See this log entry. 9) Jim Dunne (Miss. State) had a student re-examine some of the solid target thicknesses from the 2004 running. The copper target came out identical to Meek's measurement, but he found the carbon target to be about 0.6% thicker. See his e-mail here. 1) Report on calculating the computer dead time with the pion-prescaling circuit enabled. 1) BCM global calibration using "local zero" method and "run-averaged zero" method. Currently, it seems that our best offsets are more consistent with those that Eric Christy found using the 1999 data rather than those that Tanja found from the Fpi-2 data. See my disscussion here. In the above link, I found the best offsets to be -0.6 mrad for the HMS angle and +0.03% for the HMS momentum (relative to Tanja's -0.13% that we have in the analyzer - so net -0.1%). If I do a combined chi-squared minimization of the 6 GeV and 2 GeV data, it favors -0.4 mrad instead, but it could also be accounted for by a small beam energy shift (smaller than the uncertainty in the measurement). 1. Short paper on light target ratios: nucl-ex/0904.448 (Figures and tables).